Everyone’s favorite peanut butter combinations together in one deliciously chewy, no-bake cookie! 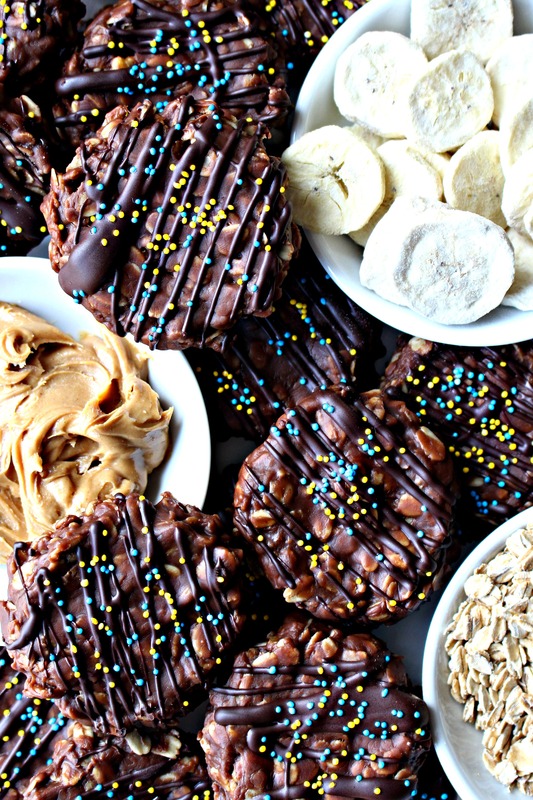 No-Bake Chocolate Peanut Butter Banana Cookies travel well in lunch boxes or care packages. The flavors and texture continue to entice, even after long international journeys! In the almost 5 (!) years that I have been recipe testing for The Monday Box, I’ve struggled with no-bake cookies and bars. The idea of something quick is always appealing and the no-bake quality is especially desirable in warm weather. Though I frequently read about cereal plus marshmallow treats being sent successfully in care packages, I can’t seem to duplicate that success. In my numerous recipe development attempts, the cereal loses its crunch in just a day or two, and the marshmallows get a bit sandy in texture. 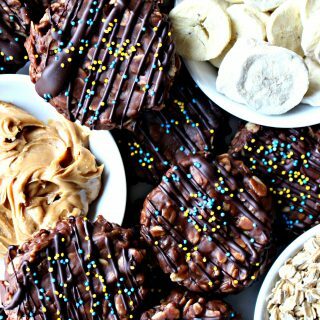 Neither of those issues are a problem with No-Bake Chocolate Peanut Butter Banana Cookies, because they don’t contain crunchy cereal or marshmallows! If I had only been a bit more reflective or analytical, I might have figured this out a while ago. 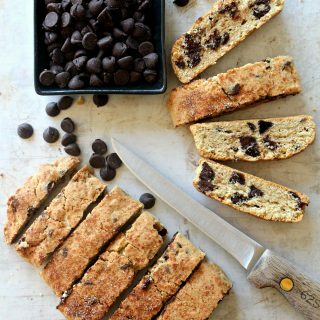 The Monday Box recipes for Granola Bars and Easter Krispie Bars, are both no-bake recipes that proved care package worthy. They are sturdy and they stay fresh and chewy for a long time. I should have thought about why. The common ingredient is corn syrup. Corn syrup holds the cookies or bars together and keeps them chewy without degrading or drying out. After more than 2 weeks, my trial batch of No-Bake Chocolate Peanut Butter Banana Cookies was just as chewy and even more flavorful than the day they were made. I learned something exciting (to me, anyway) about oats while making these cookies. I never stopped to think about what the difference might be between regular, quick cooking, and instant oats, other than knowing that regular oats are way chewier in cookies. It turns out that quick cooking oats are just regular oats that have been chopped up a bit, so that the little oat pieces more quickly absorb moisture. In the past, I stocked my pantry with both regular and quick cooking oats. If a recipe called for quick cooking and I was out of it, I ran to the store. Now, I know that with a few pulses of the food processor, I can turn regular oats into quick cooking oats! Does that amaze anyone else? Despite my delight in that oat discovery, I paid no attention as I poured three cups of regular oats into a recipe that originally called for quick cooking! In defense of my absentmindedness, I did go to the cabinet reaching for the carton of quick cooking oats. Then I saw a big bag of gluten free oats that I use when baking for my daughter. I redirected my hand to the gluten free oats thinking that if I used them, I could share some of the cookies with my gluten free daughter. I was well into mixing the ingredients together before I realized what I had done. As it turned out, No-Bake Chocolate Peanut Butter Banana Cookies are really good with regular oats! Quick cooking oats would probably provide a bit less chew, but my taste testers don’t want me to make any changes! Another ingredient that’s worth mentioning, is the bananas. Please don’t consider using fresh bananas in this recipe, especially if the cookies will be shipped. 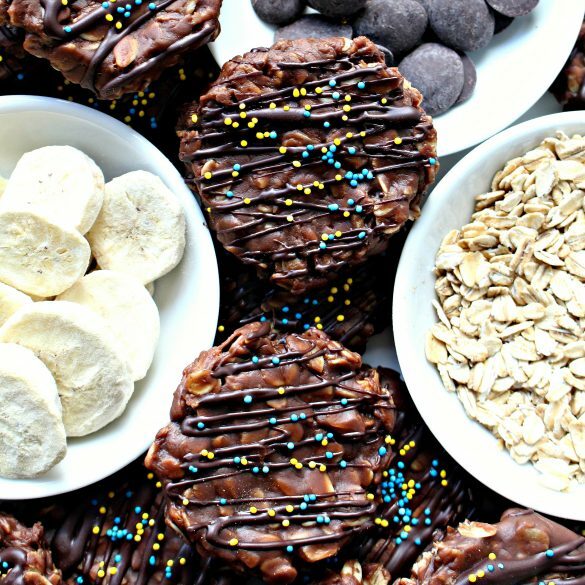 Fresh bananas in a no-bake cookie will provide too much moisture and the cookie may not hold together. Also, fresh bananas will spoil. I made crunchy bits of banana goodness by gently crumbling freeze dried banana slices. All of the moisture is freeze dried out, the bananas crumble easily, and spoilage is avoided. 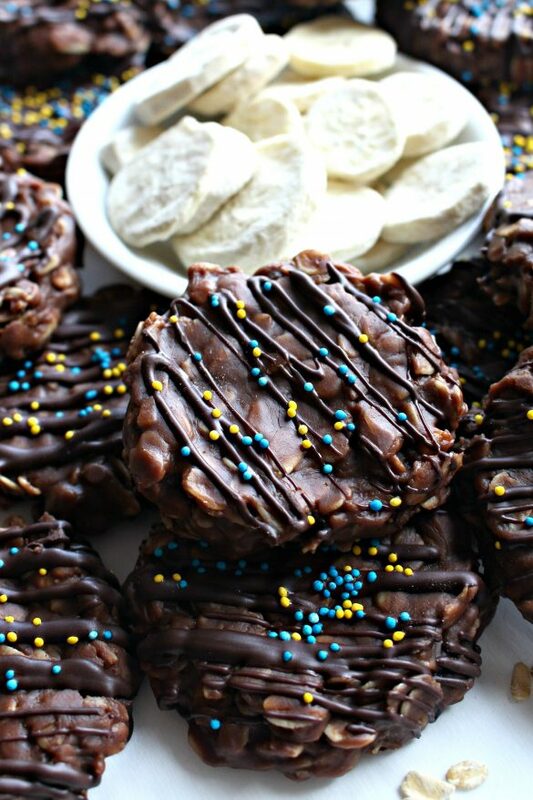 No-Bake Chocolate Peanut Butter Banana Cookies don’t need any embellishment for deliciousness. I added a peanut butter chocolate drizzle because how else was I going to get the sprinkles to stick. I added the sprinkles because I love sprinkles. Also, I used blue and yellow sprinkles to tie these cookies into the Minion theme I used for my most recent military care package. Minions are also the reason I added bananas to these cookies. Did you know that Minions love bananas? Please check back in a few days to see the Minion cookies and themed items in Military Care Package #28! In a large sauce pan over medium heat, stir corn syrup and sugar to combine. Heat just to boiling, then remove from heat. Add peanut butter, vanilla, and chocolate chips and stir until melted. Add crumbled banana and oats. Stir to combine. Scoop 2 tablespoon portions (medium scoop) of dough onto wax paper lines counter or baking tray. Use finger tips to gently press dough into ½” thick discs. To add drizzle: Place melting chocolate discs and peanut butter in a bowl. Microwave on 50% power for about 1-2 minutes until chocolate is melted. Mix to combine. Drizzle the melted chocolate-peanut butter over the cookies and add sprinkles immediately. Allow to firm for 1 hour. Store cookies in layers separated by wax paper, at room temperature in an airtight container for up to 2 weeks. No-bake cookies should be separated from one another with wax paper, either in small plastic wrap bundles inside a freezer weight ziplock bag or layered in an airtight container with extra wax paper on top to keep the cookies from shifting during shipment. 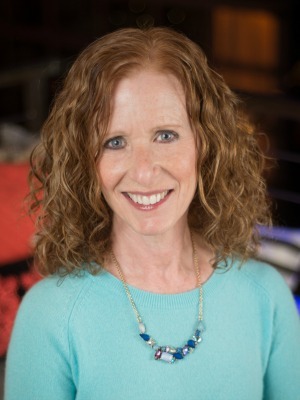 These sound and look delicious Wendy – I love the combo of flavors! I’m pretty crazy about sprinkles too – they make everything better. 🙂 That is good to know about the oats – it’s something I wondered about. No Bake cookies sound fantastic!..what a lovely snack, can’t believe you have all those in that cookies. My kids will go crazy looking how choco it looks.Those sprinkles with sauce is so sinful! Thank you, Srivalli! 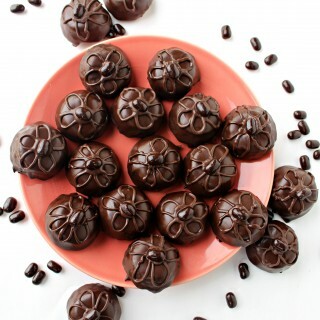 These are a chocolate treat that kids love. 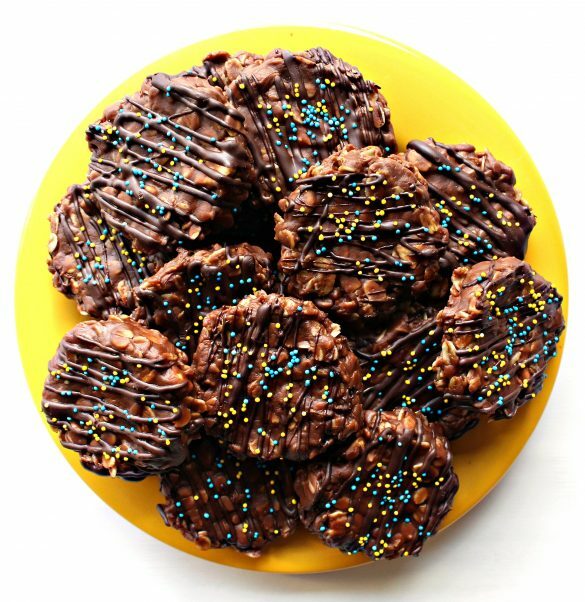 I love no bake cookies – especially when my daughter comes home from school and announces at 5pm that she has a bake sale the next day. Always happens! 🙂 I’ve never heard of freeze-dried bananas – such a cool ingredient. I’ll be checking out my local bulk foods store this weekend for freeze dried fruit. Gotta make these! Oh, I always loved the 5pm (often on a Sunday) announcement about bake sales, major research requiring a trip to the library, posters, and massive projects! Freeze dried fruit is usually carried in the produce department in foil-like bags on a rack. Apples, pineapple, banana slices, berries, and mango are common. I get mine usually at Trader Joes, but all of our regular supermarkets carry it. They wouldn’t be in the bulk section, because unlike plain dried fruit which is soft, freeze dried fruit must be kept airtight. No-bake cookies are the greatest. You don’t need to heat up the oven or get out lots of equipment. Although the cookies are sweet they have some great ingredients in them. Perfect for an afternoon snack for the kiddos! Can’t wait to make these for the grandsons. Thanks, Marisa! I agree, the no-bake cookies do tend to be sweet. I like to make them in a smaller size for just that reason. They also taste wonderful cold from the fridge or freezer! Oh my does these look amazing! And you combined my family’s favorite combo, peanut butter and chocolate! I love a no bake cookie but like you, mine never tend to stay crunchy and just lack the appeal of others. I’m not sure where I can find freeze dried bananas, but I’m on the lookout so I can make these STAT! Thanks, Megan! Once you start looking, I think you will be surprised at how easy it is to find freeze dried fruits. All of our regular supermarkets carry foil-like bags of freeze dried bananas, apples, berries, and pineapple in the produce department on racks. I usually buy mine at Trader Joes in the nuts and dried fruit area. 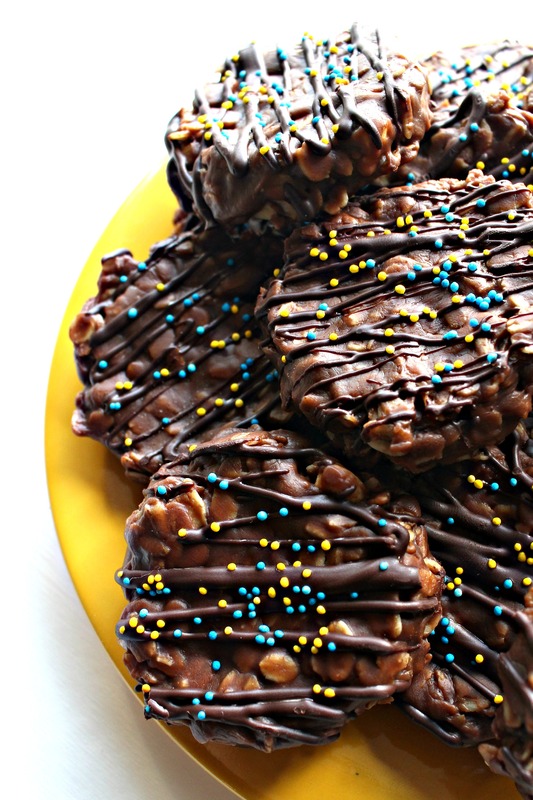 No bake treats are such an awesome idea. I’ve never really experimented with them a lot but these look so good. I didn’t know that about oats..that was a good lesson to learn that I’ll have to remember next time when using oats. Thanks, Stephanie! I was so surprised to realize I could buy only regular oats and make my own quick-cook when needed! Omg these look incredible. I don’t know how many times I’ve made the same oat mistake! Love this recipe and I’ll make it for my hubby this week! I so rarely think of making no-bake cookies. I have no idea why, but these look so fun! Love the drizzle and sprinkles on top. I think this one would be a favorite in our house – chocolate, peanut butter, and banana – these are staple flavors my family cannot live without. Your photography is so gorgeous and vibrant that I had instant cravings for these!! Perfect with a cup of tea! Thank you, Abby! I especially appreciate you kind words about the photography because that is the blogging area I struggle with the most. These no-bake cookies are definitely perfect with a cup of tea! These look so good and rich in flavor. I love no-bake snacks/dessert recipes, makes things so simple 🙂 Now, I just need to get few of the listed ingredients and try this at home soon. Thank you, Molly! The freeze dried bananas are available at Trader Joe’s or in the produce section of most supermarkets. I hope you enjoy the cookies. You are right, that they are rich and sweet. 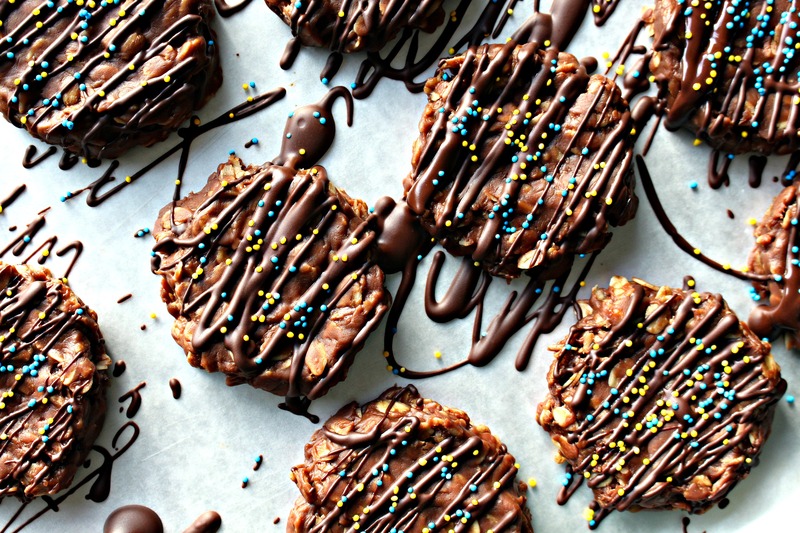 Those cookies look absolutely delicious and I can’t believe that this is a no bake recipe. That was some good info on the oats. I can now just buy the regular oats for all the recipes. Thanks, Sandhya! I was excited about the oat info too! I can’t believe I used to run to the store if I didn’t have quick cooking oat for a recipe! 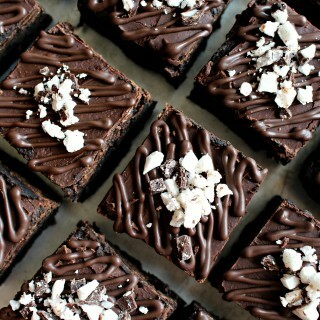 OMG I need to make these ASAP cuz they literally combine my three favourite foods. I may have to make a 1/2 batch though because I know I won’t be able to stop eating till they’re all gone ? Thank you, Giselle! It is easy to half the recipe for portion control. 😉 You could also freeze half….but maybe not because they taste really good frozen too! Anything with no bake will always catch my attention! 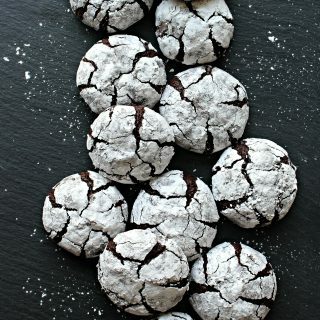 These cookies looks so delicious and I like the sound of the crunch! Perfect on the go food as well as a treat at home 🙂 Happy Fiesta Friday! Thank you, Petra! 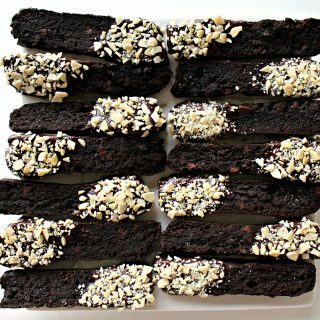 These cookies do travel well (as long as it’s not so hot that they melt) and make a great on the go treat! Happy Fiesta Friday! What a wonderful flavor for your delicious cookies! Happy Valentine Day and thanks so much for sharing your awesome talent with us at Full Plate Thursday! Thank you, Miz Helen! Happy Valentines Day ! 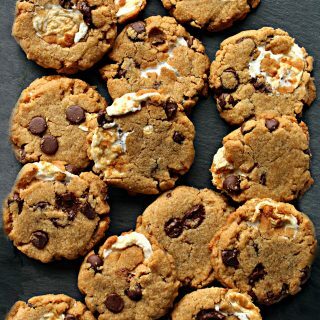 The triple flavor combo of these cookies is a winner. 🙂 Thank you for hosting Full Plate Thursday!